Fr. Cekada released yet another juvenile video (this one is called “SSPX and Bitter Fruit: Look Whose Talking”), which is supposed to be a critique of our 700 page book "True or False Pope?". Guess what Cekada did for his book review? He skipped over the first 650 pages (the first 20 chapters) of our book which contain all the theology that refutes the errors of Sedevacantism! That’s right. jumping to the very last chapter (Chapter 21, called “The Bitter Fruits of Sedevacantism”), which is the only non-theologically focused chapter in the book. This chapter is simply intended to show the unusually bitter fruits within the Sedevacantist sect (admitted to by its own adherents), and was in no way necessary to prove the already-proven theological arguments contained in the previous chapters, as any honest reader could ascertain. That’s why we made it the last chapter. In Bishop Sanborn’s January 2016 Most Holy Trinity Seminary Newsletter, he informs us that “Fr. Cekada has purchased the book [True or False Pope?] and is analyzing it.” If this video is the best that Fr. Cekada can do, it looks like Bishop Sanborn is going to be very disappointed. Interestingly, these authors (Salza/Siscoe) both speculated that Fr. Cekada would do exactly what he just did (focus on Chapter 21), as a diversionary tactic, since we anticipated his inability to respond to the theological material (and the exposure of his specific errors), found in the previous 20 chapters. He is certainly predictable. Fr. Cekada’s latest video further illustrates that he is running away from the real, theological issues that are no doubt keeping him up at night. his theological deficiencies. And he even dresses up his latest video with pictures and sounds of a crying baby, who is grimacing while literally tasting bitter fruits. Very odd indeed. But what’s most ironic is that it is Fr. Cekada who is truly grimacing throughout the video, as his facial expressions make clear. And his grimace turns to seething anger by the end of the video. Fr. Cekada’s approach is to criticize our last chapter discussing the bitter fruits of Sedevacantism, by showing that there have also been bitter fruits among non-Sedevacantists (that is, true Catholics) in Church history, as well as in the Traditionalist movement itself (as if that were news to us! ; it’s a classic red herring). Fr. Cekada especially focuses on the infighting that has occurred within his former religious order, the Society of St. Pius X, over the years (the SSPX is Cekada’s main target of the video, with whom he appears to have an axe to grind; in his typical condescending manner, he refers to Salza and Siscoe as mere “flacks” for the Society). So, Fr. Cekada’s strategy in the video is to show that true Catholics have also experienced the bad fruits of disagreements and division. So what? We can almost hear the baby in the video crying, “I’m not bad! They’re bad too!” What kind of argument is this? Now think about this for a moment. Fr. Cekada skips over 20 chapters which are full of theological arguments against Sedevacantism, and focuses exclusively on the only chapter in the entire book that was not intended to be theological. He then complains that this last chapter does not refute the theological arguments of Sedevacantism, which are contained in the chapters he skipped over! Incredible! It’s difficult to imagine a more ludicrous argument. But the argument is very telling, as it shows us just where Cekada stands in this debate (in quicksand, up to his neck). We have never argued that the bitter fruits of Sedevacantism “prove” that Sedevacantist theology is erroneous. We addressed the doctrinal errors and bad theology in the first 20 chapters of our book (which Cekada has yet to address). of our book, is about the flawed and erroneous theology of Sedevacantism, a good portion of which has been invented in the last several decades by Fr. Anthony Cekada himself. To date, Fr. Cekada has conspicuously failed to substantively address any of our theological arguments, most noticeably those which target his own errors. This failure to respond to our theological arguments is quite conspicuous, wouldn’t you say? 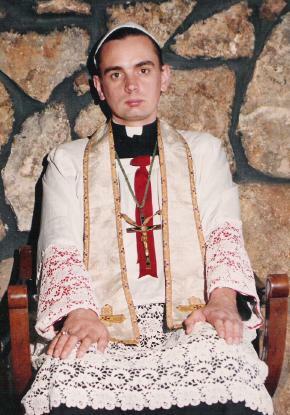 Especially for the leading Sedevacantist priest in America, and one of the most prolific spokesmen for the sect. When will Fr. Cekada stop making foppish videos and start addressing our (or, rather, the Church’s) theological arguments against the absurdity of Sedevacantism? Time will tell. But if he’s pressed for time (it takes time to produce and choreograph those silly videos at St. Gertrude the Great parish! ), he can start with the very short and direct articles above. Moreover, if Fr. Cekada really wants to compare and contrast the bitter fruits of Sedevacantism with those of the SSPX, it’s no contest (and why he would posit such a comparison is baffling). The rotten fruits of Sedevacantism go beyond mere disagreements and infighting, and involve true “spiritual maladies,” as Sedevacantist John Lane admits. One might ask why Fr. Cekada spends so much of his priesthood writing articles and making ostentatious videos which attack, mock and ridicule those who disagree with the Sedevacantist position (even when they don’t mention him personally). Is this not itself evidence of a spiritual disorder? Even Cekada’s partner, Bishop Dan Dolan, recently joked that their parish should “get him a director’s chair and sunglasses.” What kind of priest seeks such attention? We also note that our chapter on bitter fruits was not primarily to highlight how Sedevacantists attack and condemn each other, although this is indeed a wicked fruit of the sect (most of the Sedevacantist clerics condemn other Sedevacantists who do not belong to their particular sect). It is absurd for Fr. Cekada to actually suggest that we are not aware of similar infighting outside of Sedevacantism, although the condemnatory conduct within Sedevacantism far exceeds the rifts and mutual disapproval that currently exists between Traditional and Novus Ordo Catholics – who nevertheless remain united under the Pope they both recognize. The real intent of the chapter was to reveal the uniquely diabolical fruits that have issued forth from the unique tree of Sedevacantism, and which have little or no parallels in Church history, notwithstanding Fr. Cekada’s little history lesson in his latest video. These, most notably, include cultish isolationism (attending only Sedevacantist chapels; rejecting all other Traditional Catholic priests and chapels); home-aloneism (Sedevacantists who reject the entire visible Church and refuse to receive the sacraments anywhere, choosing instead to “worship at home”), and Conclavism (Sedevacantist sects who elect their own Pope, resulting in more antipopes than at any period in Church history). So, while it is true that there are always chaff mixed in with the wheat in the field of the true Church (and hence one can always find bad fruits to spotlight), the rotten fruits in Sedevacantism are clearly in a category of their own. The reason for this is because Sedevacantism is itself a rotten tree, just as is Protestantism and any other anti-Catholic movement. We can further point out the uniquely rotten fruit of dishonesty in scholarship, which is pervasive in the works of those Sedevacantists who choose to publicly defend their sect. As the readers of our book will see, this dishonesty involves editorial subterfuge that includes not only creating novel theological theories that have no precedent in Church history (too numerous to mention here; see Chapter 21), but also citing half-sentences out of context, and removing complete sentences, and even paragraphs, from citations (without ellipses), false allegations of inauthentic resources (claiming legitimate quotes have been "invented") and even accusations of fraud against non-Sedevacantist researchers (see summary of these techniques, also in Chapter 21), all intended to deceive their own flock. And when these purveyors of deception are caught with their pants down, they never (at least not to date) retract their errors, but remain even more emboldened in their position. Of course, it goes without saying - or making an “idiotic” video - that immoral conduct exists outside of Sedevacantism, even among true Catholics, and we never said otherwise. But true Catholics have not rejected the definitive teaching of the Magisterium, which condemns those who formally separate from their Patriarch (e.g., the Pope) before a public judgment of the Church. Thus, the bitter fruits of Sedevacantism have a spiritual dimension that will always be qualitatively worse than those among true Catholics who have not formally separated from the Church. Fr. Cekada needs to drop the “director’s chair” and “sunglasses,” because his videos are nothing but smoke and mirrors, which seek to draw attention to himself and away from the arguments he cannot address. 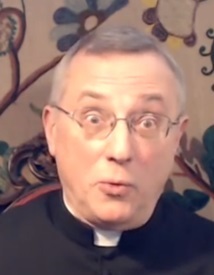 His latest video is one big, fat straw man (“There is fighting outside of Sedevacantism, too! We’re not so bad!”) that he wanted to knock down, since he himself has been knocked down to the ground. This is all part of his diversionary tactic to keep his audience distracted while he avoids the theology that has already sunk his ship. More of the same childish videos from Cekada – which will surely come our way - will only confirm that he is unable to defend himself and his grievous theological errors, which our book exposes at great length, and which we will continue to expose at www.trueorfalse pope.com. Stay tuned. Fr. 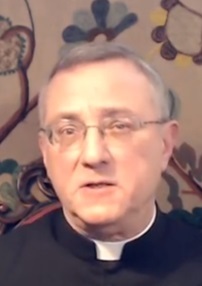 Cekada’s primary claim in the video is that the historical infighting among Catholics and religious orders of the past was due to the failure or inability of the Popes at the time to “exercise their authority effectively at the local level.” But that same argument could be used today, where the conciliar Popes have failed to use their binding authority to condemn the errors that have invaded the Church. The difference is that the Catholics of yesteryear did not seek to resolve their objections to the Popes’ failures by declaring them deposed by their own private judgment. Thus, the main point of Fr. Cekada’s video does nothing for his Sedevacantist case.